Small - $39.99 Medium - $39.99 Only 7 left! Large - $39.99 Only 6 left! Get your cape on! Even superheroes have to go to school to learn how to use their abilities, and super-schools don't get much better than Super Hero High. 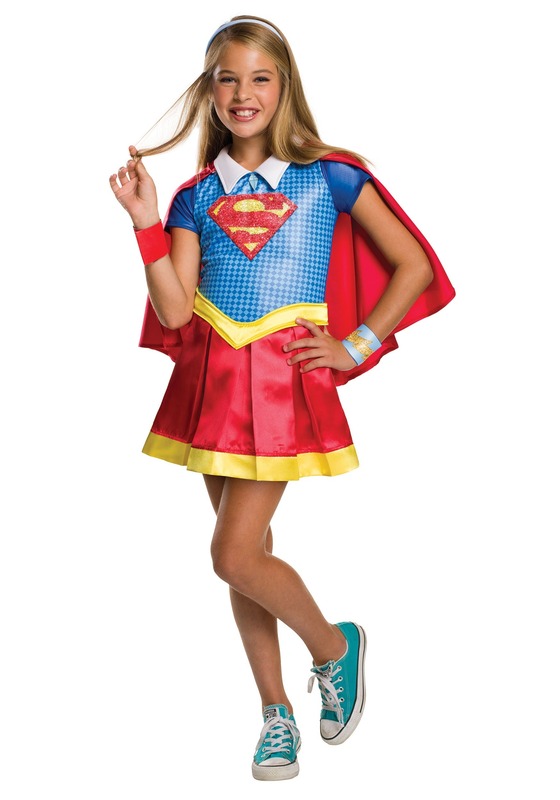 Your little superhero-in-training will have a great time learning the ropes while dressed up in this Supergirl Deluxe Costume, from the DC Superhero Girls cartoon! Boy, if you think attending Super Hero High sounds tough, imagine going there with the word "super" already in your name! That's what Supergirl runs into everyday at class. Her uncle, Superman (maybe you've heard of him), may be one of the most legendary heroes in history, but she's still getting the hang of all her powers. Sure, she can fly faster than a speeding bullet, but she still trips over her own feet when she walks. And while her super heat vision can be pretty formidable, she doesn't know if she's going to accidentally blast a hole in the wall whenever she tries using it! She keeps on trying, though, and is always ready to share some of her optimism with her friends. She's going to be a great superhero someday when she gets the knack of all her powers, but she's already got a super-sense of fashion. The one-piece dress features a pleated skirt, and the big, sparkling symbol of Supergirl's family, the House of El, on the front. The most heroic feature is definitely the costume's detachable red cape, which is sure to flutter majestically in the wind, wherever she goes. When your super girl dons this super costume, she's sure to have a time that will be positively... well, super!